The name is the “European Association of Nuclear Medicine” abbreviated to EANM. The official language is English. The EANM was founded in 1985 by members of the “Society of Nuclear Medicine – Europe” and the “European Nuclear Medicine Society”. The Association is registered in Vienna, Austria, according to the “Austrian Law of Associations 2002” (“Österreichisches Vereinsgesetz 2002”). It extends its activities throughout and beyond Europe, supporting and promoting Nuclear Medicine, in particular biomedical imaging and radionuclide therapy for personalised healthcare. To facilitate the daily workload, the EANM runs an Executive Office by means of the EANM Conference and Association Services Ltd (GmbH), organised as a company with limited liability. This company is 100% owned by the EANM. Its major task consists in the administration of the EANM and all its entities and subsidiaries. Its relationship with the EANM is the object of a separate contract. The Association, which is a voluntary non-profit making organisation of persons, aims at improving public health and promoting science and education in the field of nuclear medicine. 3.1 To promote the safe practice and to advance the science and education of nuclear medicine. This term signifies the use of radionuclides for diagnostics, therapy, and biomedical research. Diagnostics include biomedical imaging, including multimodality and hybrid imaging, and non-image-based procedures. 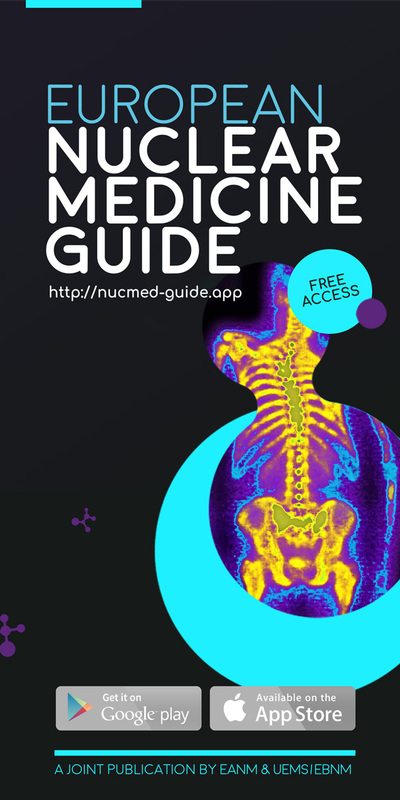 In biomedical imaging, radionuclide imaging is usually combined with various other imaging modalities for correlative or supporting purposes, with the aim of improving diagnostic algorithms as part of the multidisciplinary approach in patient management. Targeted therapy, radiobiology, radiation protection, medical physics and radiopharmacy are part of the scope of Nuclear Medicine. All these activities are to benefit public health and humanity within the concept of personalised healthcare. 3.2 To promote, develop and co-ordinate throughout Europe and beyond the discussion and exchange of ideas and results in diagnosis, treatment, research and prevention of diseases by making use of unsealed radio-active compounds. 3.3 To provide a suitable medium for the dissemination and discussion of the latest results in the field of Nuclear Medicine and related subjects. 3.4 To convene an Annual Congress. 3.5 To represent with one voice all European Nuclear Medicine activities in the field of science, education and the promotion of good and safe practice by providing information, reasoned comment and argument vis-à-vis European Authorities, the UEMS/EBNM, the International Atomic Energy Agency, the World Health Organisation, the World Federation of Nuclear Medicine and Biology, and other organisations. 3.6 To foster the harmonisation of vocational policies within Europe and beyond, by conducting appropriate surveys and forwarding suitable recommendations to the Authorities, in cooperation with other medical organisations, where appropriate. 3.7 To promote professional training in Nuclear Medicine through various means of training and education. 3.8 To act as an advisory body of experts and lead European activities concerning regulatory affairs relevant for nuclear medicine (education and training, radiation dosimetry and safety, instrumentation, quality control and assurance, radiochemical and radiopharmaceutical production and usage). 3.9 To establish open dialogues with the authorities of the European Union, other institutions and relevant national and international organisations. 3.10 To establish committees for specific areas of interest, e.g. congress, research, education and training standards, outcomes, management, professional and ethical issues, radiation safety etc. 3.11 To cooperate with relevant scientific societies. 3.12 To provide support, awards, grants etc. and all other means considered useful to the aims of the Association. 3.13 To produce and/or publish professional journal(s) in the field of nuclear medicine, molecular imaging, diagnostic imaging and therapy related subjects. 3.14 To produce and/or publish guidelines in the field of nuclear medicine, molecular imaging, diagnostic imaging and therapy, including relevant aspects of medical physics and radiopharmacy/chemistry. 3.15 To protect and promote intellectual property. 3.16 To organise public awareness campaigns. 3.17 To liaise with patient organisations. 4.1 Funds of the EANM may be raised by individual membership fees, and by contributions from National Societies of Nuclear Medicine or equivalent as in article 5.10, as participation income, and by any other means that the Board shall decide. Gifts or donations may be incorporated into the funds of the Association. Fundraising from commercial organisations is subject to Instructions set forth in the Transparency and Conflict of Interest Policy. All funds and income referred to in this article 4 shall be used to pursue the Objective of the Association as stated in clause 2. 4.2 The EANM may participate in, establish or acquire enterprises or companies in Austria and abroad. EANM may become a member of associations and set up associations. 4.3 Income from the Organisation and promotion of the Annual Congress and other scientific and educational events. 4.4 Income from retail of teaching materials of any kind (printed, web-based, etc.). 4.5 Income from cooperation with scientific societies that will generate income. 4.6 Acquisition of support, awards, grants etc. and all other financial contributions considered useful to the objectives of the Association. 4.7 Income from publication of professional journal(s) in the field of Nuclear Medicine, Molecular Imaging, Diagnostic Imaging and Therapy and related subjects. 4.8 Income from guidelines in the field of Nuclear Medicine, Molecular Imaging, Diagnostic Imaging and Therapy and associated domains. 4.9 Income from its intellectual property. 4.10 Income from international funds, EU and other grant money. In conformity with the aims of the EANM and the universal nature of scientific research, membership is irrespective of language, ethnic group, religious orientation or gender. Any physician or scientist with a completed university degree or equivalent education, who is mainly engaged in nuclear medicine and committed to the objectives of the EANM, will be able to become an Ordinary Member of the EANM. Junior Membership can be obtained upon request by any physician or other scientist during his/her formal training in Nuclear Medicine or related fields. It is restricted to the period of training with a maximum duration of 5 years and is subject to an age limit of 38 at the date of application. Any qualified nurse / technologist / radiographer / research technician/ laboratory worker active in nuclear medicine may become a Nurse/Technologist Member of the EANM. Associate Membership of the EANM is open to any other person working in the field of nuclear medicine or related fields. Student Membership is available for medical, science or technical students during their study period. After obtaining an academic degree, the membership status will automatically change to “Junior Member”. No voting right is granted to Student Members. To further the interest in Nuclear Medicine among young scientists, Student Membership shall be free of charge. Emeritus Membership is available upon request by Ordinary Members upon retirement. This Membership type is reserved for persons of outstanding distinction practicing in the field of nuclear medicine and who provided great service or reputation to the EANM or the field of nuclear medicine. Corresponding Honorary Membership is reserved for persons of outstanding distinction in related disciplines, who have provided great service to the EANM or the field of nuclear medicine. Corporate Membership can be offered to individuals, societies, associations or companies interested in promoting the aims of the EANM. No voting right is granted to corporate members. National Societies of Nuclear Medicine, or, in the absence of such a Society, the recognised section of Nuclear Medicine or, in the absence of both aforementioned bodies, the national body for specialisation in Nuclear Medicine that has ordinary members of the EANM, representing a member state of the Council of Europe, may apply to the Board of the EANM for the status of a National Member Society. National Societies of Nuclear Medicine, or equivalent as in 5.10 representing a country, which is not a member state of the Council of Europe, of neighbouring countries with special affinities to Europe may apply to the Board for the status of an Affiliated Member Society. The Delegates’ Assembly must endorse the decision. 5.12 Honorary Members and Corresponding Honorary Members are approved by the Members’ Assembly upon proposal from the Board. 5.13.1 The Membership will be terminated by the loss of legal capacity, voluntary termination or in the case of death. 5.13.2 Termination may be voluntary by any member, by giving written notification three months in advance of the next calendar year to the Secretary/Treasurer. 5.13.3 Termination will be obligatory if a Member has remained one year in arrears with his or her membership fees despite two warnings in writing from the Executive Office. 5.13.4 Termination will be at the discretion of the Board if a Member is considered to have brought the EANM into disrepute. A Member may appeal to the Court of Arbitration. 5.14.1 Every member is entitled to take part in the EANM’s activities in accordance with the objectives and principles of these Statutes, and to make use of its facilities upon availability. All Members shall promote and protect the objectives of the EANM as set out in the Statutes. All Members shall pay the appropriate approved membership fees of the EANM. Ordinary, Junior, Nurse/Technologist, Associate and Emeritus Members in good standing have the right to vote at the Members’ Assembly. All members have the right to be informed of and to participate in the activities of the EANM, and the right to propose in writing to the Board names for Honorary Membership and Corresponding Honorary Membership. Only Ordinary Members from countries which have the status of a National Member Society, or equivalent as in 5.10, being such for more than the last 3 years, have the right to take office in the Board or the Court of Arbitration of the EANM. 6.1 For all elections, approvals and decisions the Quorum is considered met with the members with voting rights present, irrespective of their number, at the time the Members’ or Delegates’ Assembly has been scheduled. 6.3 If the necessary majority cannot be reached in the first vote, a second vote shall be held. If the necessary majority cannot be reached in the second vote the Board will cast the deciding vote. This vote of the Board has to be unanimous. The Organs of the EANM are the principal governing bodies of the Association. The numerous bodies ensure a democratic and transparent functioning of the Association. Positions in any organs should be subject to geopolitical considerations, but irrespective of language, ethnic group, religious orientation or gender. • The Court of Arbitration. The Members’ Assembly is the Association’s forum for Members in good standing to exchange information and discuss the work of the elected representatives, financial issues and the future of the Association or other items according to the agenda. It shall cater for and serve the needs of individual members of the Association. The President chairs the Members’ Assembly. 7.1.1 The Members’ Assembly is open to all EANM Members in good standing and a representative of each Corporate Member. The Members’ Assembly takes place once per year during or about the time of the Annual Congress, the time of written notice of the agenda being at least 6 weeks. 7.1.2 Items can be added to the agenda and discussed under “other items”, if approved by the Assembly. Voting on those items can only take place at the time of the next regular meeting. 7.1.3 If there is no Annual Congress, the Members’ Assembly must still meet once per year, as the Annual General Meeting of the EANM, by being called by the President. The time of notification of the date of the Annual General Meeting should be 12 weeks; the time of written notice of the agenda should be at least 6 weeks. An Extraordinary Members’ Assembly may be called either by the Board or by the Auditors or if at least one-tenth of the ordinary members demand this in writing from the President of the EANM. The time of notification of the date of the Extraordinary Members’ Assembly should be 12 weeks; the time of written notice of the agenda should be at least 6 weeks. An Extraordinary Members’ Assembly must have ten per cent of members present from more than 3 different countries. 7.2.1 The Members’ Assembly will have the authority to carry out the functions of the Association in accordance with the objectives and principles of these Statutes. To receive the Annual Report by the Board. Reports may be disseminated by the President whenever necessary. To exonerate the Board with regard to the financial management of the Association. To discuss the general policy put forward by the Board. To present individual views to the Board. To elect the Secretary/Treasurer from all applications received. To elect the Scientific Liaison Officer. To appoint two members of the Ethics Committee. Applications have to be received by the Executive Office at least 6 weeks prior to the Assembly. To appoint one member of the Court of Arbitration, if necessary. Applications have to be received by the Executive Office at least 6 weeks prior to the Assembly. To approve Honorary Members and Corresponding Honorary Members upon the proposal of the Board. To approve the change in membership fees, as proposed by the Board. To vote on changes in the Statutes. To implement the dissolution of the Association. 7.2.3 The Secretary/Treasurer must ensure that the Executive Office circulates information about positions open for elections to all members, at least 12 weeks before the Members’ Assembly. All candidatures for positions on the Board must be made known in writing to the Executive Office, stating the name and affiliation of the candidate, the office, name and affiliation of the proposer and two seconders, who must all be from different nations represented in the Delegates’ Assembly, and the consent of the candidate to accept the position, if elected. These applications must be received by the Executive Office at least 6 weeks before the meeting of the Members’ Assembly at which the election is due, which is normally during or about the time of the Annual Congress. 7.2.4 Any paid up member may apply. Board Members should refrain from proposing or seconding candidates. 7.2.5 The Secretary/Treasurer must ensure that the Executive Office circulates the details of the applications for officers of the Board, proposers and seconders, as set out in these Statutes, to all members of the EANM, at least 6 weeks before the Members’ Assembly. 7.2.6 No candidature will be accepted from the floor of the Members’ Assembly. If no applications have been received for an office or position, the Board has to make a proposal. Elections are undertaken according to the procedure set out above. Ordinary Members applying for a position on the Board must be from countries, which have the status of a National Member Society, or equivalent as in 5.10, and having been member of the EANM for at least three years. Proposals to change the Statutes can be made by the Board or by individual Members. In the latter case, they must be lodged with the President in writing not later than 12 weeks before the Members’ Assembly and must be supported by at least 100 Ordinary Members. Such proposed changes must be submitted for advice to a Constitution Committee that reports to the Board, who submits them for discussion and vote (2/3 majority) to both the Delegates’ and the Members’ Assembly. The Delegates’ Assembly is the Association’s forum for delegates of the various European National Societies or equivalent as in 5.10. It shall cater for the national needs and prepare grounds for a common strategy. The President chairs the Delegates’ Assembly. Each delegate represents one country and its voice towards the overall policy of EANM put forward by the Board. 7.3.1 The Delegates’ Assembly shall consist of one Ordinary Member of each National Society of Nuclear Medicine as specified in 5.10. Nomination of this Delegate and a deputy Delegate member to the Delegates’ Assembly is effected by the national Nuclear Medicine Society or equivalent as in 5.10. 7.3.2 A Delegate/Deputy can be accepted by the EANM only upon the proven status of the National Society being officially representative for Nuclear Medicine in the respective country. Duration of office is four years, renewable for one further four-year period. National Nuclear Medicine Societies or equivalent as in 5.10 may apply in writing for an exemption of this rule that may be granted by the Board. 7.3.3 Only Ordinary Members of the Association are eligible as Members of the Delegates’ Assembly. The deputy National Delegate will act as a substitute for the National Delegate for the duration of office of the National Delegate. 7.3.4 The ordinary Delegates’ Assembly shall take place at least once a year, earlier than the Members’ Assembly, during the Annual Congress, the time of written notice of the Agenda being at least 6 weeks. If there is no Annual Congress, the Delegates’ Assembly will be called by the President, giving 12 weeks written notice of the date and at least 6 weeks written notice of the agenda to National Societies. 7.3.5 The National Delegate represents the views of the National Society or equivalent as in 5.10. Each country has a single vote, which is cast by the National Delegate. In case the National Delegate cannot attend the meeting, the deputy National Delegate may substitute and will cast the vote. Voting by proxy is not permitted. Abstentions or invalid votes of the National Delegate or its Deputy are not counted. 7.3.6 An interim Delegates’ Assembly shall be held each year in spring. The time of written notice of the agenda should be at least 6 weeks. For decisions to be valid during an interim Delegates’ Assembly at least fifty per cent of the National Societies who have voting rights must be represented. To receive the Annual Report of the Board. To bring forward the views of the National Societies to the Board of the EANM. To elect the President Elect. To elect the Committee Coordinator. To appoint two Members of the Ethics Committee, if necessary. Applications have to be received by the Executive Office at least 6 weeks prior to the Assembly. To elect one Delegate representative to the Court of Arbitration. The Advisory Council is the connecting link between the Board and the Committees. The Advisory Council shall act as platform for the exchange of tasks and reports and to define and delegate common tasks. Being the scientific council of the EANM it is deemed committed to policy and long-term planning. It makes proposals on the aims and priorities of Committees. The Advisory Council ensures the coordination and follow-up of activities of Committees and makes their conclusions available for the strategic planning of the EANM. Additional observers who may be invited by the Board as deemed necessary. 7.5.2 It meets at the time of the Annual Congress and at such time as the President requests; the time of written notification of the Agenda is normally at least 6 weeks. The President and Committee Coordinator chair the meeting of the Advisory Council. 7.5.3 It may propose Honorary as well as Corresponding Honorary Members to the Board. The EANM Board is the highest executive level of the Association. It shall create a vision for the future of the Association and develop strategies to fulfil them as well as to develop strategies regarding the cooperation with partner societies for the future of the medical specialty and the benefit of its Members and National Member Societies. It shall execute and supervise the execution of operational goals along the strategic lines as developed together with the different Organs of the Association. The Board represents the EANM legally and is responsible for its financial management according to the Statutes and legal regulations. It may initiate the creation of policies and procedures for different purposes. New policies and procedures need the final approval of the Board. The Board will be accountable to the Delegates’ and Members’ Assemblies. For any kind of meeting, the Board may take advantage of alternative meeting technologies and techniques such as tele/video-conferences. Decisions can be made via electronic media, if all members agree. 7.6.2 Decisions of the Board will be taken by simple majority vote. The EANM President will cast the deciding vote in case of a deadlock. To be responsible for the short- and long-term planning of the EANM. To act as the official representative of the EANM. To sign with the Secretary/Treasurer appropriate documents/contracts for the EANM. To chair the Board, the Advisory Council, the Delegates’ Assembly and the Members’ Assembly. To act as Honorary Editor of the official journal of the Association during his/her term of office. To appreciate and become cognisant with the overall lines of policy and directions of the EANM as a whole. To help in periods of transition between officers of the Board and to assist the President in officially representing the EANM. Upon request from the Board, the President Elect can take on special tasks (including but not limited to the tasks in connection with the functions of the Board as described in article 7.6). In case of early retirement or physical incapacity of the President, the President Elect takes office as President immediately until the end of his/her own mandate. Interaction with the EANM National Member Societies. To foster the next generation in Nuclear Medicine through various initiatives. Political relations with sister associations in the field of Nuclear Medicine. Any other responsibilities that may arise in relation to the implementation of the strategy. 7.6.6 The Secretary/Treasurer of the EANM is elected by the Members’ Assembly for a two-year term, renewable once. To ensure that the correspondence of EANM is appropriately dealt with and filed. To ensure that proper invitations and agendas are sent to the Board, Advisory Council and Delegates’ and Members’ Assemblies in accordance with the deadlines set forth in the Statutes. To ensure that the Agenda and Minutes of all Meetings and Assemblies are sent out in good time. To ensure that the Executive Office circulates information about positions open for elections to all members, at least 12 weeks before the Assemblies. To ensure that the Executive Office circulates the details of the candidatures for officers to the Board, proposers and seconders, as set out in these Statutes to all members of the EANM, at least 6 weeks before the Members’ Assembly. To ensure that all resolutions passed by the Board, Advisory Council, Delegates’ Assembly and Members’ Assembly are recorded and to document the short- and long-term plans of the EANM in the Minutes of those meetings. The Minutes shall be signed by the EANM President and Secretary/Treasurer. To ensure the storage of a complete and updated membership list. To ensure the circulation of the nomination papers in good time. To ensure that the EANM website is kept up-to-date. To be the liaison officer regarding contract negotiations with publishing houses. To propose the budget for the next year to the Board. To carry out the financial dispositions as decided by the Board. To ensure that accurate records are kept as stipulated in § 34 Federal Fiscal Code (“Bundesabgabenordnung”). To sign invoices and payments and to approve balances as set up by an external tax advisor. To sign with the President appropriate documents/contracts for the EANM. To report to the Board, the Advisory Council, Members’ Assembly and Delegates’ Assembly on the financial state of the EANM, through a written account of income and expenditure for the preceding fiscal year (the fiscal year of the EANM being 1.1 – 31.12). To submit these accounts to the auditors and to discuss the general financial status with the auditors and external tax advisors. To be responsible for coordinating the activities of the Committees and to actively make recommendations to the Board. To co-chair the Advisory Council Meeting. To require and receive from the Chairpersons of Committees written activity reports, which should indicate to what extent present goals have been reached. To present the budget and accounts of each Committee to the Board. To receive proposals for new Committees and to advise the Board on the completion or termination of activity of Committees. To coordinate EANM guideline production, including joint guidelines with partner societies. 7.6.8 The Congress Chair Elect is elected by the Delegates’ Assembly one year before the end of the term of the Congress Chair, when he/she takes office as Congress Chair for a three-year term, renewable once. This second period has to be approved by the Delegates’ Assembly. The Congress Chair Elect works in close collaboration with the Congress Chair and becomes member of the Board when taking office as Congress Chair. The Congress Chair must announce his/her decision to seek for renewal in the second year of his/her term of office. Depending on his/her decision, the election of the Congress Chair Elect shall take place one year before the end of the first or of the second period. To establish the Scientific Programme of the Annual Congress. To design and chair the opening and closing ceremonies. To identify and propose candidates for the Congress Committee, who are appointed by the Board for 3 years. The Congress Committee establishes the scientific congress programme. Details are regulated in the “Instructions for Annual Congress”. 7.6.9 The Education Chair Elect is elected by the Delegates’ Assembly one year before the end of the term of the Education Chair, when he/she takes office as Education Chair for a three-year term, renewable once. This second period has to be approved by the Delegates’ Assembly. The Education Chair must announce his/her decision to seek for renewal in the second year of his/her term of office. Depending on his/her decision, the election of the Education Chair Elect shall take place one year before the end of the first or of the second period. The Education Chair Elect works in close collaboration with the Education Chair and becomes member of the Board when taking office as Education Chair. To propose to the Board a strategy for all educational activities. To chair the European School of Multimodality Imaging and Therapy (ESMIT) and be responsible for all its activities. 7.6.10 The Scientific Liaison Officer is elected by the Members’ Assembly for a two-year term, renewable once. Ordinary members with a higher university degree (PhD, MD-PhD, MD or equivalent) who are predominantly active in research can apply for this position. The second period must be approved by the Members’ Assembly. To liaise with national or international scientific organisations/societies on behalf of the Board. To serve as scientific advisor to the Board in regulatory affairs, in close cooperation with the Committee Coordinator. To represent the EANM Board within the EANM Forschungs GmbH (EARL, European Association Research Limited). To develop, support, coordinate and maintain the scientific agenda of EARL. 7.6.11 Observers can be appointed by the Board to participate in individual meetings. Observers have no voting rights. 7.6.12 The Board should meet at least three times per year. The EANM President is responsible for calling a meeting. Members of the Board are notified of the date normally at least 6 weeks before a meeting is to take place, the agenda being presented two weeks in advance. The Members of the Board and other officers of the Association for their time of office shall be indemnified out of the funds of the Society against all costs, charges, losses, damage and expenses, respectively, which they shall incur or be put to on account of any act, deed, matter or thing which shall be executed, done or permitted by them in good faith in or about the execution of their respective offices. Establishing and updating the broad policy as well as implementing the appropriate means to follow the strategic plan for the Association. The overall budget of the EANM, including the Congress Budget. Proposing Membership fees and administering the funds of the EANM. Convening the Advisory Council, the Members’ and Delegates’ Assemblies and reporting its activities to them. Carrying out the decisions of the Delegates’ and Members’ Assemblies. The decision to launch or dissolve Committees and Task Forces, and to appoint Chairpersons and Members thereof as appropriate. Establishing internal procedures for the work of the Association and the Congress, as deemed necessary, e.g. Transparency Guidelines, Instructions for Committees, Instructions for Annual Congress, a strategy for education etc. Proposing Honorary Member and Corresponding Honorary Members to the Members’ Assembly. Agreeing, by simple majority, in advance, liabilities above € 80,000. Appointing members of the Congress Committee. 7.7.2 The Board may hire external professionals for support, such as Association Management Company, Accounting and Auditing Company, Tax Advisor, Legal Advisor or others. 7.7.3 Positions on the Board should be filled with due consideration of balancing the geographical areas within Europe. 7.7.4 Officers of the Board may resign from office before their term is completed on giving three months’ notice in writing to the President or Secretary/Treasurer. 7.7.5 The appointment of an officer to the Board can be terminated at any time by a decision of the other members of the Board, if this officer is considered to have brought the EANM or the Board into disrepute, or to have acted against decisions taken by the organs of the Association. Such a decision may be appealed to the Court of Arbitration. 7.7.6 In case of termination, incapacity or any other impossibility of Board Members to finish his/her term, the Board shall entrust the tasks to a person of its choice, from within or outside the Board, until the next election. The purpose of Committees is to implement the EANM activities. 7.8.1 Chairs of Committees are appointed by the Board. They report on their activities twice a year to the Committee Coordinator, who informs the Board, Delegates’ and Members’ Assemblies. 7.8.2 By completing the annual matrix, Committees must propose a yearly budget to the Committee Coordinator, who presents it to the Board for approval. The Secretary/Treasurer should assist with advice in this matter. An annual report on work in progress and financial status must be submitted for approval to the Board. 7.8.3 Committees shall be composed of up to 8 members. Any exceeding of this number has to be approved by the Board. 7.8.4 Committees shall announce vacant positions to Members and shall make their selection upon best qualification and under consideration of a reasonable geopolitical representation of the Committee Members. Final appointments are to be approved by the Board. Committee Members shall reside in countries that are represented in the Delegates’ Assembly. This Committee will be set up by the Board when changes in Statutes are considered. The Chair and Members of the Constitution Committee are nominated by the Board, to whom they must report in writing within six months. The Secretary/Treasurer of the EANM should liaise with the Constitution Committee without being a formal Member. To consider proposed amendments to the Statutes. To undertake the careful wording and evaluate the effects of the proposed amendments, taking particular note, that they do not conflict with other paragraphs of the Statutes, the various instructions of the EANM or with the legislation of Austria. To propose additional changes, if necessary. To report on the working of the Statutes of the EANM to the Board. The committee comprises five members of EANM of different nationality and gender – two being appointed by the Members’ Assembly, two by the Delegates’ Assembly and one by the Board. The Ethics Committee should be asked for advice and recommendation on issues with ethical implications in the life of the EANM – including matters of actual or potential conflict of interests or unethical conduct of EANM Officers or Members and any consequences thereof that may result in harm to the EANM. In particular, the committee will evaluate the yearly conflict of interest declarations of all officers in post and report to the Board, proposing improvements or sanctions, if applicable, as specified under 8. 7.9.1 Task Forces can be formed to help meet the objectives of the EANM and terminated when necessary by the Board. 7.9.2 Task Forces are open to members willing to perform a specific task in a given period of time defined by the Board (maximum three years). 7.9.3 Chairs of Task Forces are appointed by the Board. Further Members of the Task Forces can be appointed by the Chair but need to be approved by the Board. Chairs report on their activities twice a year to the Board, which in turn reports to the Delegates’ and Members’ Assemblies. 7.9.4 Task Forces are given a budget for their project. In the event of the need for additional funds, the Chair shall propose the required budget, including a description of the presumptive use, to the Board for approval. The Secretary/Treasurer should assist with advice in this matter. In return a work in progress and financial report must be submitted annually to the Board for approval. The accounts of the EANM shall be audited by two Ordinary Members elected by the Members’ Assembly and by an externally registered auditor, who is qualified as accountant, tax advisor or certified public accountant. A third chosen by the aforementioned two Members, who shall be acceptable to both and who shall act as Chair and have the decisive vote should any deadlock occur. If no agreement is reached as to the choice of Chair, the decision shall be taken by lot. The Court of Arbitration shall decide in matters of dispute as conscientiously as it can by majority vote, without being bound by fixed rules. 8.1 The nominees for any positions at EANM shall, upon nomination, and after being elected, annually or in case of a change, declare any mission, appointment, financial conflict or other tie that may risk or constitute any actual or potential conflict of interests in particular in connection with functions they may have in other organisations or in enterprises. They shall also disclose any potential damages that such risk may cause to the EANM. The disclosures shall be made available to members upon request. If officers fail to submit their disclosures until a given deadline, they will be suspended from their duties for 3 months. Failure to declare conflicts of interest within these three months results in dismissal without appeal. 8.2 In the event of a conflict of interests, the interest of the EANM shall have priority over interests and obligations of loyalty that an EANM officer may have vis-à-vis third parties. 8.3 When in doubt, the issue should be submitted by the Board to an Ethics Committee for advice. The voluntary dissolution of the EANM may be approved if proposed as a resolution in writing to the Board by at least one-half of the Delegates. To be effective, it must be agreed by two-thirds of all members with voting rights in both the Members’ and Delegates’ Assembly. In case of dissolution of the Association, by the official authorities, or should the Association change its objectives and no longer fulfil the criteria of section 34 of the Federal Fiscal Code (“Bundesabgabenordnung”), a properly qualified lawyer should be appointed as liquidator and any assets remaining after settlement of all financial commitments of the Association and including the fees due to the liquidator, shall then be given to such societies or organisations as have similar objectives to the EANM and fulfil the criteria of section 34 of the Federal Fiscal Code (“Bundesabgabenordnung”) at the sole discretion of the Board.